Harman's headquarters facility, which houses the Pro and Lifestyle Divisions including its Consumer and Luxury Audio groups, is where engineering, testing, and training take place. In this day and age, to find an audio company… or any company for that matter… that stills designs, engineers and makes its own products from scratch is a rarity. But that “Old School” mentality has served Harman International well for decades, and continues to this day in its massive Northridge, Calif., headquarters. That heritage, spawned by co-founder Sidney Harman back in 1953, can still be seen today even after its acquisition by Samsung in late 2016, where Harman remains a wholly separate, independent subsidiary that continues to do things its own way. Indeed, if you ever get a chance to visit the Harman International campus in Northridge, Calif., be prepared to be totally blown away. The massive facility was originally a 44-acre campus with multiple buildings housing more than 200,000 square feet of engineering and production. 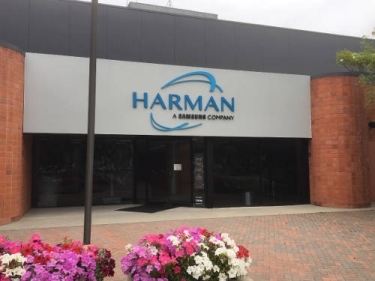 The factory is gone, and many of the buildings have been leased, but the facility is still large enough to house both Harman’s Pro and Lifestyle Divisions, which includes its Consumer and Luxury Audio groups. The Northridge facility has several hundred employees with a representative from every Harman division, including automotive, consumer, luxury audio, pro, and lifestyle. That means under one roof you might bump into renowned engineers like Dr. Floyd Toole, Kevin Voecks or Sean Olive, while checking out the facility’s four anechoic chambers, five listening rooms, multiple training rooms, and a giant open concept Pro Division area showcasing everything from recording studio setups to digital signage. Employees from the Pro Division are divided between AMX’s base in Richardson, Texas, and Northridge, but the company’s entire Lifestyle division, including finance, sales, and marketing is in based in Northridge. Being all under one roof has multiple benefits, according to Jim Garrett, senior director of product strategy and planning for the Luxury Audio Division. “The fact that we are co-located with the Professional Audio team in the same location is beneficial,” comments Garrett. “I can just walk over there and talk with them at a moment’s notice. We talk on a regular basis to find out what they are going to with their units for durability, mounting, etc. For us, we can use that for advance testing. The Luxury Audio engineering team based in Northridge share resources with the Pro division. Luxury Audio team can use the Pro group’s labs with transducer testing and 3D machines, while the Pro Division has access to the anechoic chambers. The engineers can use the Stereolithography (SLA) 3D printers for rapid prototyping, saving enormous re-tooling costs. For example, engineers can create new speaker horn geometry, 3D print it in a few hours, and immediately take it into a lab, bolt a transducer to the back of it, put it in a box and take audio measurements. It can then be refined using clay, and by the time you are ready to cut steel you have the real deal. Back in November 2016, some Harman integrators expressed they were “nervous” following the $8 billion buyout by Samsung. But it turns out those worries were unfounded. “Now that we are connected to Samsung, it has allowed us to have even more resources available to us. That allows us to compete on a different level where a lot of our competitors cannot compete,” says Garrett. There is no Samsung staff on site. “As far as that goes, we are a wholly owned completely separate independent subsidiary of Samsung.” Since the acquisition, Harman has maintained all its facilities and its entire management team. Harman might be the progenitor of using consumer brand name affinity to benefits custom integrators. The company’s Consumer Division of JBL, Harman Kardon, and AKG target mass-market consumers. The mass-market consumer side has a lot of strength right now, especially in the portables category from the JBL side with the Flip, Click, Go, Extreme, Boombox, Pulse and the Charge. “When you look at the breadth of the product market penetration we have, the brand names are helping to expose a new generation of customer to Harman." “Those seven SKUs probably do more revenue combined that most audio brands in the custom electronics industry. “That represents a huge piece of business for us,” comments Jim Garrett. Those powerhouse SKUs are the market leaders in the portables category and set the tone for the industry in terms of Bluetooth portable speakers. In the headphones category, JBL and AKG also capture a strong marketshare. Likewise, for soundbars, JBL has carved out a niche with its new Bar 1-2, 3-1 and the 5-1. The 5-1 is unique because it has detachable battery-powered surround speakers that charge when the unit is docked or can be charged separately. The design targets a limitation that many soundbars in the market have, in that they offer clarity to dialog but the faux surround is usually lacking. “The benefit of the consumer brands is the strength of the brands, especially JBL,” says Garrett. “When you look at the breadth of the product market penetration we have, the brand names are helping to expose a new generation of customer to Harman. At the facility, Harman conducts its Luxury Audio Training Academy regularly so those attendees, which in many cases are retailers, get a chance to see the facility. Garrett says more and more retailers, like Nebraska Furniture Mart, Starpower and ListenUp!, are now putting big JBL Synthesis units in their showrooms to give clients a taste of the high-end luxury and instituting traditional top-down selling. There are four anechoic in chambers at the facility, each designed for different sized speakers or transducers. The Luxury Audio Training Academy (which was being conducted by the renowned Dr. Floyd Toole the day of CE pro’s visit) is primarily focused on loudspeakers. So it is heavily into Revel, JBL and JBL Synthesis because Northridge is the engineering facility for those speakers. Day two of the academy includes a trip to Kevin Voecks’ house. Harman offers another academy focused on Mark Levinson out at its Shelton, Conn., facility. The company also recently started a dedicated workshop on JBL Synthesis. It was borne out of requests from attendees at the Luxury Audio Training who wanted more technical information on JBL Synthesis, such as how to calibrate and set up the processor, how to do room correction, proper speaker placement, programming the amplifiers, room acoustics, etc. Lastly, Harman just started doing trainings for Arcam over in Cambridge, U.K. Most of these academies occur twice per year, so when you add it all up, the company is doing eight to 10 per year. End users also visit the facility quite often. Northridge is in close proximity to Van Nuys Airport, which caters to the jet-set Hollywood crowd. That means wealthy end users looking to spend six figures on a JBL Synthesis home theater can fly in, drive over, and demo the systems in one of the cinema rooms. “That is a very effective selling tool,” notes Garrett. Altogether, Harman has over 500 SKUs of equipment between all the brands, and the vast majority of them are in the Luxury Audio Division. It can quickly add up when you start counting all the mounting brackets and other peripherals we have for some of the brands like Revel. Speaking to the lengths to which the Harman team goes to test its equipment is the facility’s Multichannel Listening Laboratory (MLL) room. It is truly one-of-a-kind. The room uses mechanical sliders to systematically move speakers that are hidden behind a curtain from view of the listener. The speakers are moved in quick succession via these mini-conveyor belts… analogous to an automated luggage system at an airport shuffling bags into position. In this case, it is speakers being moved into the listening position… all randomly and quietly so the listener cannot detect any pattern. Harman uses the room to subjectively test its new speaker models versus previous versions, but more often than not it is to listen to speakers from competitors. The test involves both trained and untrained listeners playing a couple of cuts of music, who then rank each test subject from 0 to 10 using a slider mechanism. The system not only generates overall preferences, but also analyzes the rankings track by track, which can be correlated to determine particular strengths and weaknesses of the speakers for areas like bass response, mid-range, etc. “That is a lot of what we do here. We want to eliminate the eyes and any perceived notions. We listen with our eyes in many ways. The speakers are behind the curtain and the selection is randomized. The automated system moves the speakers and plays them in random order,” say Garrett. SDP-75 processor (30 channels are being used). 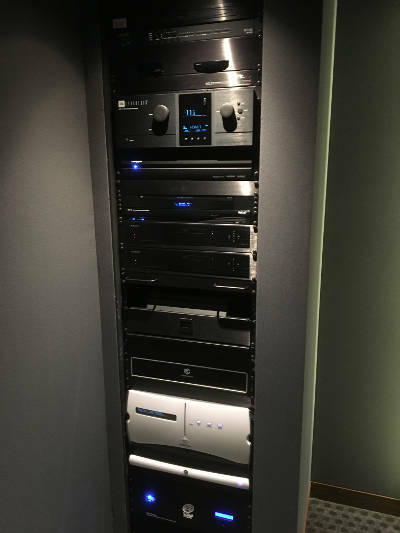 In all, there are six listening rooms between the Pro and Consumer divisions in the Northridge facility, including a fully immersive $750,000 30-channel home theater that can pull content from a wide variety of sources, whether it be physical, streaming or gaming. The theater features AcousticSmart seating and acoustical panels, DPI projector, Middle Atlantic racks, 15-foot-wide 2.40-1 aspect ratio Screen Research screen, Apple TV, Roku streamer, Lumagen video processor, two 4K Oppo Blu-ray Disc Players, Kaleidescape Strato media server integrated with an M700 Disc Vault, Torus Power Isolation Transformer, and a Sony PlayStation 4 Pro gaming console. All the A/V is driven by URC control via handheld remote and touchpanel, which also controls the programmed Lutron lighting scenes. There is not a single speaker visible in the room, yet there are nearly 30 speakers in the room. 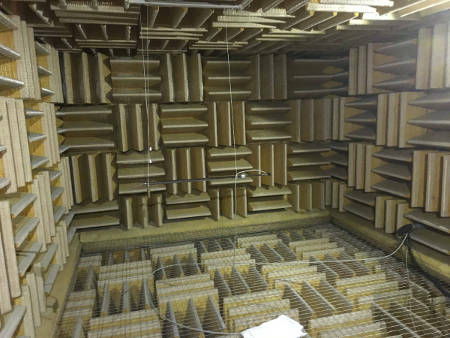 Some audio companies struggle to construct a single anechoic chamber… Harman has four of them inside the building, along with several other measurement spaces outside the building. Also, one of the two arenas on the Pro side can be used as a measurement chamber. The anechoic chambers are constructed to be completely independent from the building. In essence, the rooms “float” on a bed of springs. For example, a lot of the bigger Pro Division products don’t fit in some of the smaller chambers. But the larger room is also wherefloorstanding speakers from the Luxury Audio Division are measured. In some cases, the speakers are laid on their sides.The larger chamber, logically, handles larger products. The size of the room makes it usable for much lower frequencies. “By developing everything on our own from the ground up, we can take a tweeter, mid-range or a woofer and hone it." One smaller “half-space” chamber is designed to measure raw transducers, which Harman develops one their own versus buying components off the shelf like many other audio companies do. The room has one hard surface that mimics the wall or ceiling behind an architectural speaker. The transducer is placed in the floor and measurements are taken in a 180-degree hemispherical pattern using nine different microphones. “By developing everything on our own from the ground up, we can take a tweeter, mid-range or a woofer and hone it. 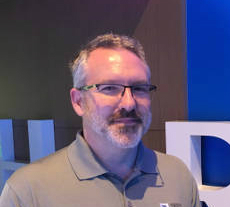 The engineers model the networks in the lab and create the performance parameters long before any drivers get to the testing phase,” says Garrett. The facility also houses the Pro Division, which is housed in an impressive space where it can showcase the combination of Harman Pro Audio solutions with Samsung video solutions. The first thing that hits you, besides a giant Samsung videowall, is the display of three GRAMMY awards on the wall: One for AKG, one for Lexicon and one for JBL Pro. “Those GRAMMYs alone make us different than a lot of other audio companies,” comments Garrett. The space also includes a mock retail sports clothing store that features a mannequin with a camera built into it. The camera uses analytics to determine if the customer is a man or woman, older or younger, etc. as the person approaches it. The system then tailors the digital signage on the videowall behind the mannequin to male or female clothing, or apparel for younger people versus older individuals. Luxury Audio Division has collaborated with Pro Division on deployments of large videowalls with high pixel densities in residential locations, where homeowners were using them has large home theaters or digital art displays. “These are hundreds of thousands of dollars but it is not unheard of. There are lots of clients putting these in their houses,” say Garrett in reference to the videowall. Other vignettes include a mock home recording studio with AKG microphones and headphones, and a smart board room/huddle room with an AMX soundbar with a built-in camera.